SEA Games silver medalist and Philippine National Team member Mervin Guarte and MILO APEX Running Clinic coach Janette Agura clinched the first place honors in the 21K male and female divisions at the 39th National MILO Marathon Calapan qualifying leg on Sunday. Calapan is one of the new locations of the MILO Marathon this year. Over 5,000 runners of all ages graced the event and helped establish the record of the biggest fun run in Oriental Mindoro, to date. Guarte and Agura have both secured their slots in the National Finals and each took home the top prize of P50,000 in cash and a trophy. Both will go head-to-head with the country’s best runners at the National Finals in Angeles on December 6, where the MILO Marathon King and Queen titles are up for grabs. This year’s King and Queen will be sent by MILO to the USA on all-expense paid trips, for a chance to run in the prestigious 2016 Boston Marathon. It was Guarte’s first time to run in the 21K category. The 23-year-old native of Calapan clocked in at 01:12:12, beating rivals Jujet De Asis (01:14:56) and Roel Galvero (01:15:34) who came in second and third place, respectively. In the distaff side, 37-year-old Janette Agura comfortably clinched the top spot with a time of 01:38:33. Jenny Manansala (02:03:17) finished in second place, and Herrera Mercy (02:15:47) in third place. 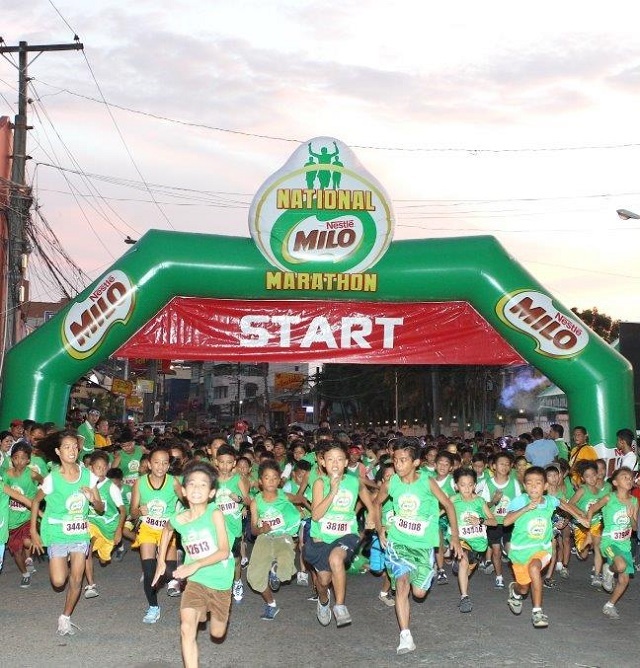 The National MILO Marathon is not only a breeding ground for local talents but also a program that empowers children nationwide. With the support of the Department of Education and the National MILO Marathon runners, MILO’s Help Gives Shoes advocacy will provide 10,000 underprivileged youth with brand new running shoes this year. MILO is working with DepEd in the selection of deserving public school student beneficiaries. The race will resume in Lipa (August 9) before heading to Naga (August 16), Lucena (August 30), Iloilo (September 20), Bacolod (September 27), Tagbilaran (October 4), Cebu (October 11), General Santos (October 18), Davao (November 8), Butuan (November 15), and Cagayan De Oro (November 22). The National Finals will be held on December 6 in Angeles, Pampanga.